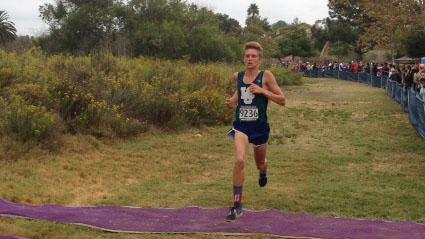 VISTA -- Caleb Niednagel studied Guajome Park's 3.1-mile course after running it for the first time in a cluster meet a couple of weeks ago. "It's just like Mt. SAC at the start," determined Niednagel, who has joined the Stanford twins at La Costa Canyon to make a powerful 1-2-3 punch this cross country season. "It's flat at the start and then a steep hill. I used it as a gauge for how to run Mt. SAC (weekend after next)." Niednagel pushed the early part of the Southern California XC Invitational Saturday over the same Guajome Park course and then powered his way to his first victory in San Diego after transferring from Dana Hills over the summer, clocking a winning time of 15:30.0. Garrett Stanford, who is slowly round back into shape after missing some serious practice time with a foot injury, finished second in 15:41.1. Westview sophomore Trang Woolridge edged Ramona's Amy Brown in the girls' race featuring each of the team's top three runners, finishing in 18:40.1 to Brown's 18:40.8. The section's top runners -- Jacob Stanford for the boys and Kristin Fahy and Jessica Riedman for the girls -- took the week off in preparation for the Oct. 19-20 Mt. SAC Invitational. Niednagel, a junior, took full advantage. "I felt really good in this race -- I felt more speed," said Niednagel already looking forward to the Mt. SAC team sweepstakes race. "I expect there to be a lot of strong teams -- like Great Oak and Claremont -- so that will be a big boost. One of the differences between Dana Hills and LCC is at Dana Hills every week we had meets with the big guys out in front." He said having the Stanfords in practice every day is huge. "We talk to each other about goals and strategy," he said. "There is no similar meet to Mt. SAC before state." As for the SoCal Championships, he said he felt strong on the course and was happy when Garrett was right behind him. As for Woolridge, she studied the competition at the starting line and determined she had as good a chance as anyone. "I knew she'd be in it," said Woolridge of Brown, who jumped into the lead as the Westview sophomore tucked right in behind her. With about 200 meters remaining at the base of the final downhill, Woolridge made her move, passing Brown. But Brown, a junior, wasn't about to give in that easily, charging back and forcing Woolridge to work every step of the way. "I waited to see who would push the pace," said Woolridge, who played soccer until last year when she tried out for cross country and after a few weeks realized she enjoyed it. "My time is a PR on this course by seven seconds and I'm proud of that." Woolridge has been among the leaders in every invitational but said competitors like Fahy make it difficult to win. "Fahy is intimidating but I compete against the big names every race," she said after taking a few minutes to catch her breath. "I look up to them, I want to be like them. But I want to keep my own personality and not psyche myself out."